Hi everyone, and welcome to the November issue of the Shanville Monthly. The big reveal this month is the UK and USA covers for Zom-B Bride -- I hope you'll agree that this is the most fetching bridal picture EVER!!!! 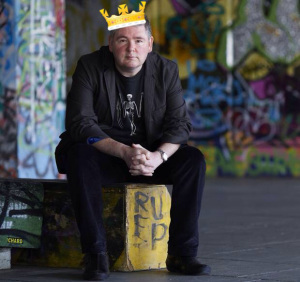 You can find out about my final public event on 2014, which takes place in London... there's news of my latest release in Hungary... links to several new interviews with me... a link to a site where you can buy the entire Saga Of Darren Shan for less than £20(!!!!!)... a couple of photos of Dante for those who dote on young Master Shan... and lots, lots more. Enjoy!!! I revealed the title of the tenth Zom-B book a few months ago, and now I'm delighted to be able to share the Uk and USA covers for Zom-B Bride with you. As you can tell, this isn't going to be a sweet, typical, bridal book -- as if there was ever a chance that it was going to be!! 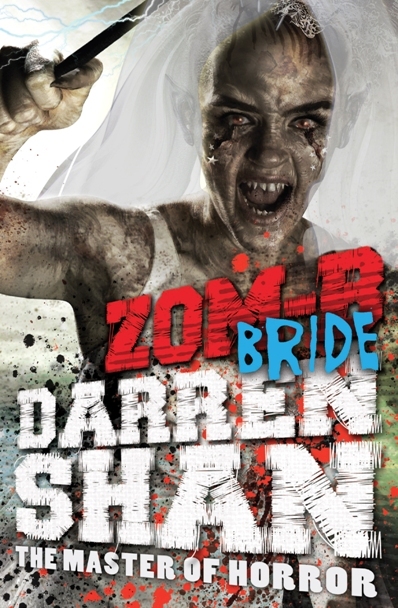 No, while Zom-B Bride IS, strictly speaking, a romantic entry in the series, it's Darren Shan-style romance, as twisted, weird and disturbing as almost anything you can imagine! This is a book where we get to visit Mr Dowling in his lair and learn a lot more about him... where we find out what the deal is with those creepy babies... and where B gets sucked ever further into the nightmarish madness that has been brewing since book 1. It's due to hit the shops in February, and I'll be talking more about it in the run-up to its release, but for now let's all simply feast on those amazing covers above. I hadn't planned to do any events after Halloween, but I got asked very late in the day if I would like to appear at the Town Hall Tales festival in East London, and as luck would have it, I was going to be in London on the day they wanted me, and I always like doing events in the East End (which is where Zom-B started, of course), so I said yes! I will be doing an event in Shoreditch Town Hall on Saturday November 15th at 2.00pm. This will be open to the public, so if you live in London, or can get there easily enough, then do please come along and join me for me final event of 2014 -- I promise to try and make it a good one! In fact, quite apart from my event, it's shaping up to be a brilliant day for readers of all ages, because I'm not the only author on the bill -- you can also check out Benjamin Zephaniah and Dan Freedman, along with shows, sing-alongs and more! Plus, as a bonus, they've kept their entry prices at a VERY tempting range -- just £5 for adults, £2 for children, or £10 for a family ticket (up to 8 people!!). And that's for the entire day and every event, not just mine!!! Folks, trust me, if you live in London or can get there on the day, this isn't one to miss!! It kicks off at 10.30am, and I'm due to start at 2.00pm. You can, of course, just turn up for my event if you wish (and yes, of course I'll be signing afterwards, and yes, of course you can bring or buy as many of my books as you wish to get signed), but I'd strongly recommend getting along earlier if possible -- I haven't seen Dan perform before, but I have seen Benjamin, and that guy ROCKS! More info about the event, and a link to book tickets, can be found on the Shoreditch Town Hall website, which you can access by CLICKING HERE. 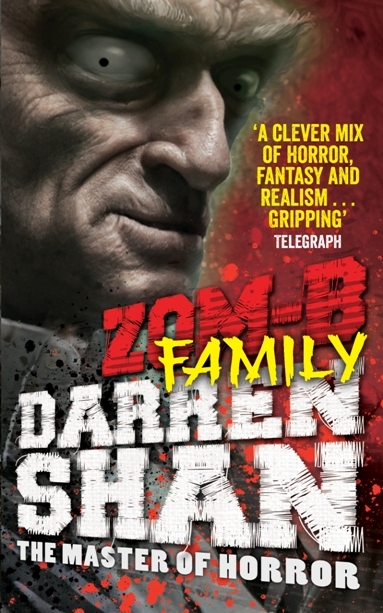 Book 9 in the series, Zom-B Family is now on sale in the UK, Ireland, USA, Canada, Australia and New Zealand. Zom-B Family is one of the hardest-hitting books of the series, and has been getting an extraordinary reaction from readers -- virtually every review I've read, whether by critics, on Amazon or Goodreads, has been 5 stars, citing it as maybe the best book in the series so far! As Empire Of Books noted in their review: "This book is honestly the darkest I think I've ever seen Shan and you know what? I loved it. It is a great addition to the series." While So Many Books, So Little Time opened their review with: "It’s no secret that I love this series, but I still kind of expected my enthusiasm to wane after nine books. Nope. Zom-B Family is perhaps the best so far." Over on Goodreads, Rachel Hobbs said: "Zom-B Family hits harder than any of the previous books, and was at times quite difficult to read. It's brutal and ruthless, touching on various things that will not only be swirling round in your head long after you turn the last page, but also make you think about the kind of world we live in today." On Amazon, Katrina E. Martin opined: "Honestly, this is my favorite volume of the ZOM-B chronicles yet. There were parts that were downright disturbing, from the disregard and degradation of humans (alive or dead...or undead) to the repulsive cruelties the deranged Dan-Dan subjects small children to, this book takes darkness and runs with it throughout the whole of the work." While over on Amazon UK (where the hardback is still just £5!!! ), Fergus Dennehy said: "Mr Shan has stepped up his game in terms of sheer brutality here. The torture scene between two characters is a detailed and organised mess of blood, flesh, maiming, blood and taunts, that will leave you with your own scars on your mind, so powerful is the writing. Even after all of this, we have death fights, brain smashing, ripping limbs and a whole host of other delightfulness that fans of Shan will sink their teeth into!" 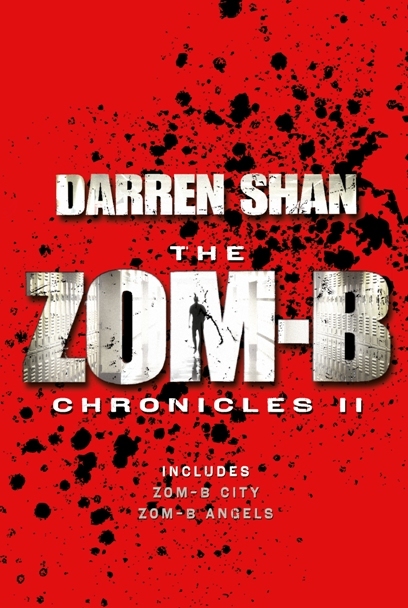 Zom-B Chronicles II, which collects books three and four of the series, in now on sale in the UK and Ireland. It should be available in all good book stores, or you can buy it online via Amazon UK by CLICKING HERE. or from WHSmith (who currently have it at the best price in the country) by CLICKING HERE That's the ultra-cool cover above -- neat, huh?!? If you have not yet bought the first volume, you can buy it from Amazon UK by CLICKING HERE. My American publishers released a collected edition of the first three Zom-B books recently, with the second volume currently scheduled to hit shops in October next year. You should be able to buy or order Zom-B Chronicles from any good book shop in the USA, but if you prefer, you can order it online through your seller of choice -- I would recommend Barnes & Noble by CLICKING HERE, or Amazon by CLICKING HERE. I really like this photo of me, which appears in issue 2 of Fusion, a magazine for and about Limerick. I also appear on the cover, in one of my favourite photos ever! The article is beautifully written and laid out — one of the best feature pieces about me I’ve ever read. If you live in Limerick, I’d strongly recommend buying a copy, not just for the piece about me, but all the other cool features too. If you don’t live in Limerick, you can buy an online edition of the magazine (it costs €2) and download and view it on any PC, MAC, iOS and Android Tablet and Mobile. No apps required. This is THE LINK. And you can find out a bit more about the online edition HERE. I was interviewed by News Shopper in Bromley, ahead of a signing that I did there in October, and you can read that interview by CLICKING HERE. I also gave an interview to The Examiner in Ireland, ahead of a Halloween event in Limerick. This is a nice, lengthy piece. To read it, CLICK HERE. 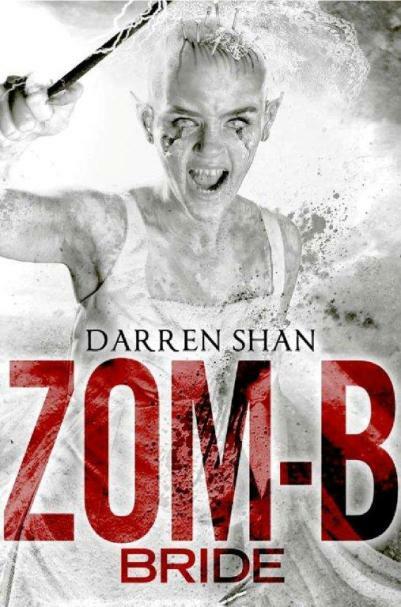 To link in with the American release of Zom-B Family on October 7th, I answered some questions about the book over on the YA Series Insiders site, where you can find out who inspired my vilest villain, Dan-Dan! To access it, CLICK HERE. The Irish Examiner ran a nice, lengthy article about me in teh run-up to Halloween and my event in Limerick. CLICK HERE. If you'd like to know what led Mrs Shan and me to call our firstborn Dante, check out this recent interview with me in the Limerick Leader, where I answer that question and a lot more. It's a very nice piece, highly recommended. CLICK HERE. The Audio Book of Zom-B Family is available to download NOW in the USA, read by Emma Galvin. All of the other books in the series are also available in audio format too, along with all of the Cirque Du Freak books. (The Saga books are available in the UK too, but not the Zom-B books -- the first few came out, but then the British audio publisher went bust!) You can listen to a free sample of Zom-B Family on the Ambling Books site, then buy and download it if you wish, by CLICKING HERE. THE SAGA OF A BARGAIN! 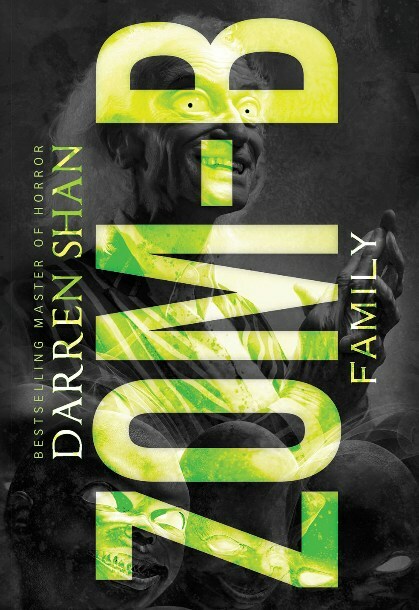 An online bookseller called Lowplex is selling the complete Saga Of Darren Shan for less than £20! All 12 UK editions of the books for less than £20?!? Can it be true?!? Apparently so!! And not only that -- the company ship worldwide, at reasonable rates! So if you don't own the UK set of The Saga, and would like to pick it up at maybe the best bargain price the world has ever seen, now's your chance!!! To view the offer and order the books, CLICK HERE. 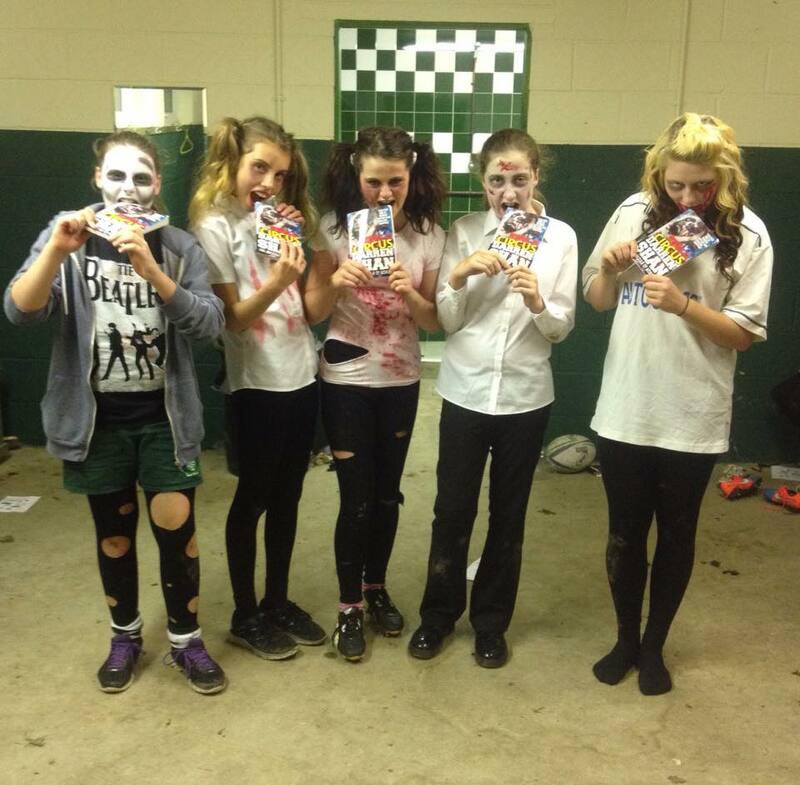 This girls' rugnby team in Basildon in the UK is one girls' rugby team I wouldn't want to mess with!!!! Great photos -- and great taste (literally!) in books, girls!!! A lot of people think that the only Darren Shan fans are teenage boys. And it's true that a large chunk of my fans ARE teenage boys. But there are lots of teenage girl Shansters too, along with some younger boys and girls, and also an increasing band of older readers of both sexes. I just got an email from one of my adult fans, who has been spreading the good word among her associates as they sail the Seven Seas, and it tickled me so much that I felt compelled to share it with you guys. So, the next time you're chatting with someone and they say that Darren Shan books are only for boys, you can clear your throat meaningfully and start your reply, "Well, actually..."
My name is Rebecca and I'm 21 currently serving in the Royal Navy. In February my ship returned from a 6 month stint in the Gulf where we visited loads of cool places including Bahrain and Dubai. Before we left I had discovered the Zom B series and had flashbacks of Mr Hoare in year 5 reading cirque du freak, I decided to rediscover my love for the vampire saga and introduced a couple of the lasses on board to it. Before I knew it I was reading out a couple of chapters per night in our recreation area every night before we racked out, it became morale boosting and got us through what would have otherwise been a long six months. Whenever we finished a book in the series we would leave it with a child in whichever place we visited next hoping that they too would discover your work. We are currently along side in our home port of Portsmouth conducting upkeep and have just finished Zom B family. We particularly have enjoyed Dan Dan in his naval uniform and HMS Belfast. I guess I am telling you this because I would like to thank you, your books reminded me of home and being a kid which is far from reality now in the military. Thanks a lot Sir! I received HUNDREDS of responses from fans of all different ages after posting the above letter on Facebook originally, supporting Rebecca's view that my books are not just for teenagers or boys. It's good to know that I have such a wide and varied fanbase out there!! 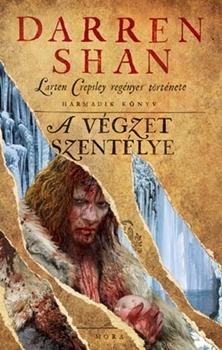 Exciting news for my Hungarian fans -- the third Mr Crepsley book, Palace of the Damned, goes on sale in Hungary this month on November 4th -- hurrah!! That's the VERY cool cover above. You can find out more about it on the MORA site by CLICKING HERE. 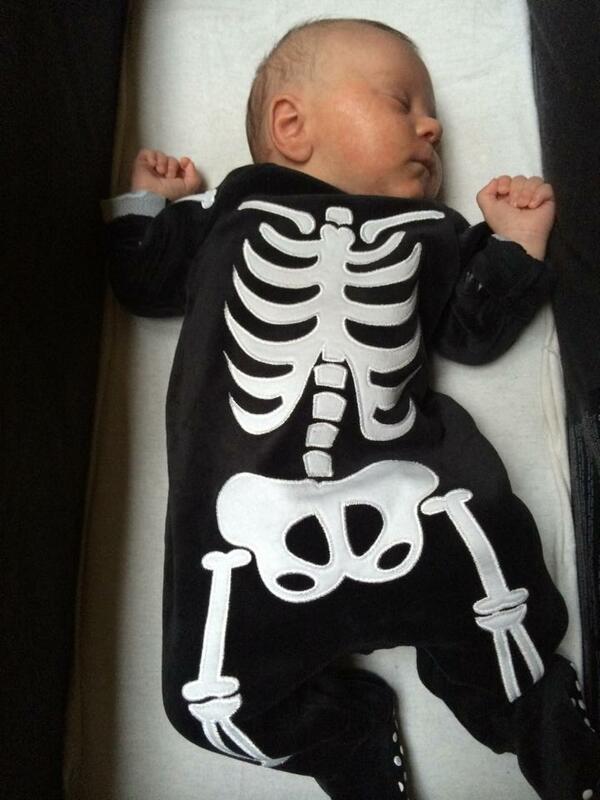 I hope you all enjoy it -- the book contains one of my favourite little twists of the series, quite early on, when the identity of a chubby little baby is revealed... See if you can guess who he is in advance!! The Guardian in the UK ran a cool Halloween competition, where you could win a complete set of the nine Zom-B books that have so far been published. They asked me to write a short piece for the comp, explaining why I love zombies. Rather than do the ordinary, I decided to answer it in the shape of a short, tongue-in-cheek poem. If you want to find out why I'm never going to win the Nobel Prize for Poetry, just CLICK HERE!!! WOW!! I was hoping for a good response to the October Shanville Monthly competition, since there were so many cool prizes up for grabs, but I didn’t anticipate anywhere near THIS kind of action! In the end I received 1,513 valid entries, from all over the world. That’s about five times more than I normally get! Because I had to sort the emails into their inidividual country categories, I read every one of them, and I noticed that many of you wrote lovely messages, saying how important my books were to you. I wish I could have replied to you all, but sadly there just isn’t time — but I DID read them all, and they actually moved me to throw in a load of extra prizes, so as well as the 18 main prize winners, a further 121 of you will be getting a signed Darren Shan book in the post! It’s going to cost me a small fortune, but what the hell, you guys are worth it!! I based the runner-up prizes on two factors — the number of entrants, plus the number of spare copies that I had for those countries. It’s going to be a real random spread of books — mostly books from my vampire series, but with some Demonata, Zom-B and adult books strewn in among the mix. I’m not going to list the names of all the runners-up, as this would become a hopelessly long and confusing post, but I’ve emailed every one of them to inform them of their win, along with the 18 main winners of course. I'm still packaging and shipping out all the books, so it will probably be well into November before I send out the last of the prizes, so please be patient and bear with me, and don't panic if you're still waiting for your prize to arrive! And now, without any further ado, here are the names of the lucky main winners, with the number of runner-up prizes in that category in brackets at the end of each name. My sincerest thanks to everyone who entered. Congratulations to the winners. And better luck next time to everyone else!! CZECH REPUBLIC: Milan Pexa (17). REST OF WORLD: Mellanie Kitchen (10). UK & IRELAND: Ryan Fulton (10). The country with the most entrants was UK/Ireland, with 640. Korea had the least — nobody entered!! Because of that, I drew a Korean winner from among all 1,512 entrants, and the prize ended up going to someone in the USA. I'm not going to run a competition this month, since I'm still processing the winners from October, but I do hope to run another in December, so tune back in this time next month!! I know that lots of you out there have been enjoying my photos of my young boy, Dante (a lot more than you enjoy photos of me, it seems!! ), so here are a couple of recent snaps. 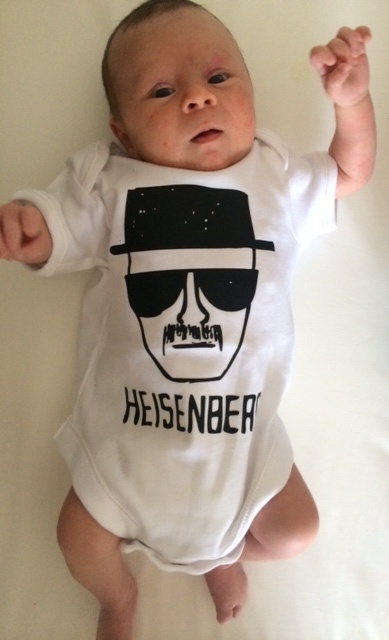 The first captures him in Breaking Bad mode, and the second sees him resting in his Halloween costume ahead of the arrival of loads of trick-or-treaters! !